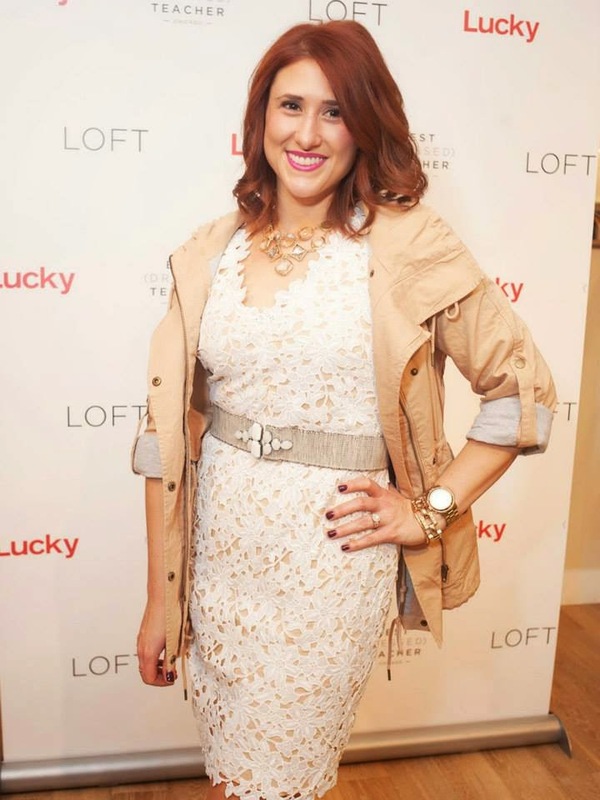 HOT PINK style: Loft Best Dressed Teacher Event - VOTE FOR ME! 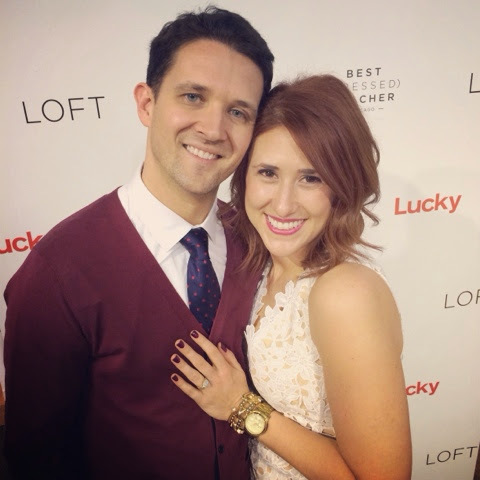 If you hadn't heard, I was lucky enough to be selected as a finalist for the LOFT Best-Dressed Teacher Contest! I'm so excited to share with you a recap of the event they held to announce the finalists. I also need YOUR help to vote for me! Voting only lasts a week on the LOFT Facebook page, so read below for the details! Let's start from the beginning, shall we? 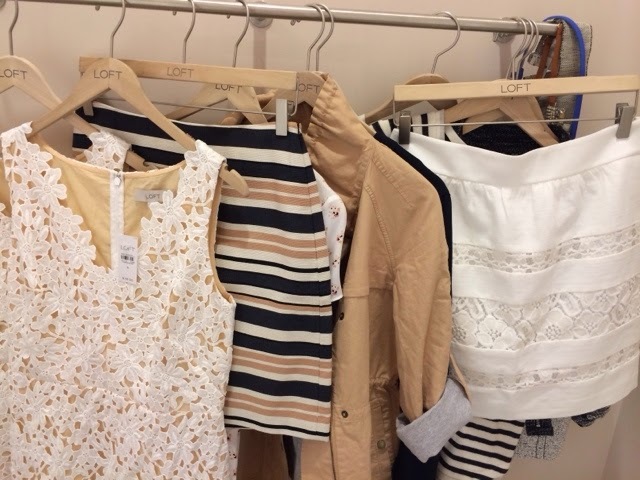 My blogger/teacher friend April shared the LOFT + Lucky Magazine contest link with me, which boasts a prize of $1,000 for our classroom and $500 in LOFT reward money to spend on cute clothes! After consulting with my friends on which of my blog looks was the most "teacher-y" we all decided that this preppy look was the most fitting for my submission. A few weeks later on my drive from school to my workout, I got a call from Lucky Magazine telling me I was one of only five finalists! I was so excited I had to pull over to call Amy and share the good news! 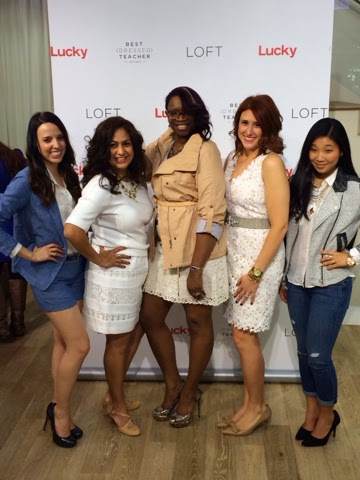 On March 20th, LOFT hosted a finalist reveal party at the Michigan Avenue store. We shopped spring looks, got our hair and makeup done, then shot a video interview that can be seen on the LOFT Facebook page. Basically we were treated like LOFT royalty the whole time! Voting begins today on the LOFT Facebook page and ends April 6th! If you have time, please stop by and cast your vote for me by "liking" the little blue "like" button under my video. that is how your vote is cast! I'd truly appreciate it, and just think of how many new books for my classroom library $1,000 could buy! It would make such a huge impact on my students! Thank you! Shopping pretty new spring arrivals in the Michigan Avenue store before the event! So many girly pieces to choose from, where do I even begin? Playing dress-up in this gorgeous lace dress and anorak at the step-and-repeat. What I finally decided on wearing for the interview. 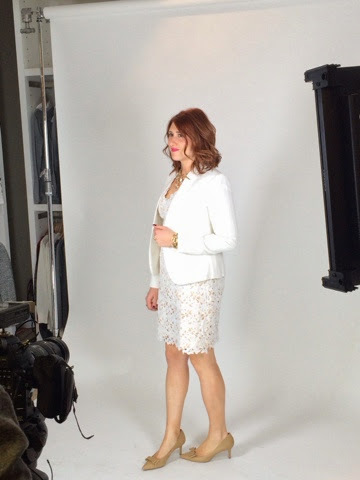 Thanks Amy for hunting down this crisp white blazer! My husband showed up looking quite dashing to support me. One stylish group of teacher finalists!